Kwanzaa is a made-up holiday, but it’s useful. OK, the holiday is made up. But for my family, it was useful. Kwanzaa is a way to bring families together. I don’t know where we got a candelabrum. But there we were, lighting the candles in the kinara and reciting Swahili words like umoja, ujima, and kujichagulia while my brother poured water from an earthenware jug onto a half-dead plant. We placed whatever fruit we had (apples, oranges, bruised bananas) onto a table festooned with African objets d’art, the kinara, and a small jug of water. For seven nights, we lit a candle and recited one of the Nguzo Saba principles, like nia for faith. The Swahili didn’t roll off our tongues, but we liked how it sounded. We performed a libation, pouring liquid from the kikombe cha umoja, or unity cup, into soil in remembrance of our ancestors. It was Mom’s idea, like the world-beat reggae concerts, Earth Day fairs, and Marcus Garvey coloring books. Kwanzaa was a way to bring our ragtag family together and nudge us away from the false idols and commercial trickery of the holiday season. We only celebrated Kwanzaa for a couple of years. That might sound like a fist-in-the-air dalliance into neo-black-holiday land. But the dismissal wouldn’t be fair. Kwanzaa may be made-up, but for my family it was useful. Kwanzaa was conjured up in 1966 by Dr. Maulana Karenga, former chair of the black studies department at California State University, Long Beach, to “reaffirm and restore our rootedness in African culture.” For my mother, a black child of the cause-oriented 1960s and ‘70s raising three black children of the Cosby-fied ‘80s and ‘90s, that seemed perfect. Since the untimely departure of my father from the family (oh, he’s still alive, mind you), my little brother had been in need of male guidance. He attended a mentorship program in which black men organized camping trips and kumbaya-ing for boys in need of a male role model. The program was Pan-African in its ideology—black role models, institutions, language, and, apparently, holidays for black people. This led us to Kwanzaa. We also had a toe rooted in the Southern Baptist church. And going to the homes of my extended family on Christmas—with their pinned-up stockings and glinting trees—showed me the importance of the holiday to black Christians. But my mom, sister, brother, and I celebrated Christmas on a contingency basis, depending on the amount of extra cash lying around. We kids could count on a toy from Santa Claus from our grandmother or from an aunt, but never Mom. She was a realist and naturalist who had spent years falling away from the church. So, in addition to our half-assed attempts at Christmas, here we were doing the Kwanzaa thing, manual in hand. If we missed a night lighting a candle and reciting a principle, no big deal, we’d just torch two candles and translate a couple of Swahili words the next night. We weren’t strict because the ritual was not a tradition. Nor would it become one. As time passed, Kwanzaa just didn’t stick. My brother quit the mentorship program, a chore we had difficulty coaxing him into anyway. As adolescents, we wanted Mom to deliver us to our fast-food jobs, basketball practices, and the comic book shop. Tapping into global African consciousness didn’t interest us. Kwanzaa tried to shoehorn us into a larger African community; we were struggling to fit into our own neighborhood. Dr. Karenga counts millions of Kwanzaa observers worldwide, but I don’t know many people who regularly set up the Kwanzaa table the day after Christmas. But what’s more American than tweaking an institution to suit your needs? Some folks who don’t go to church pine for more than the dancing black Santa from Wal-Mart. Plus, Kwanzaa and Christmas are not mutually exclusive—’tis the season of peaceful co-existence. A rule of Kwanzaa states that one “should not mix the Kwanzaa holiday or its symbols, values and practice with any other culture.” But Kwanzaa starts the day after Christmas, so until Dec. 26, you can drink eggnog out of a gourd shell. 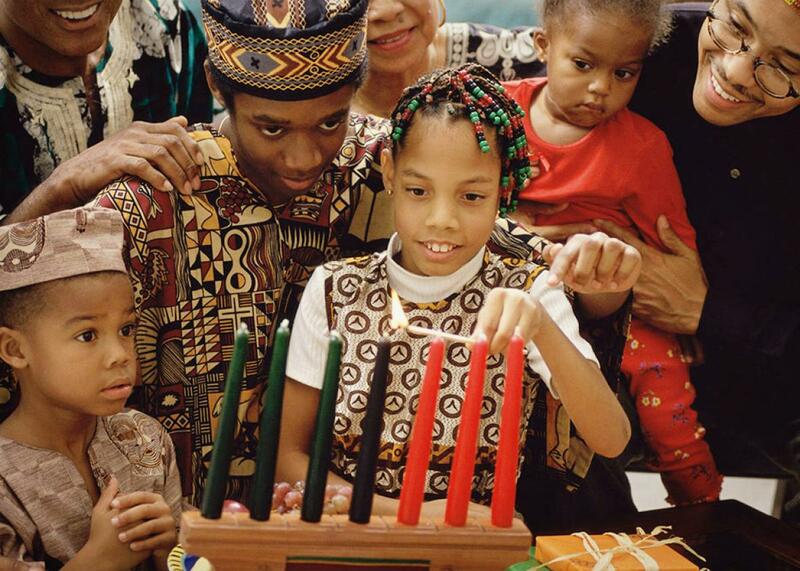 Kwanzaa’s principles are expressed in Swahili, the co-opted language of the ‘60s black radical. But they still reflect what most experts on the black condition scream are missing from our homes: unity, self-determination, collective work and responsibility, cooperative economics, purpose, creativity, and faith. Sure, some of these echo Christian tenets. Some, though, speak to the educational, financial, and familial repair that is needed specifically in black communities. My simple defense of Kwanzaa is that in the short time that we celebrated the holiday, it brought my family together. We weren’t hitting the after-Christmas sales or trying out our new bicycles. We were kneeling around an altar and watching as the water ran from the jug in my brother’s hands.